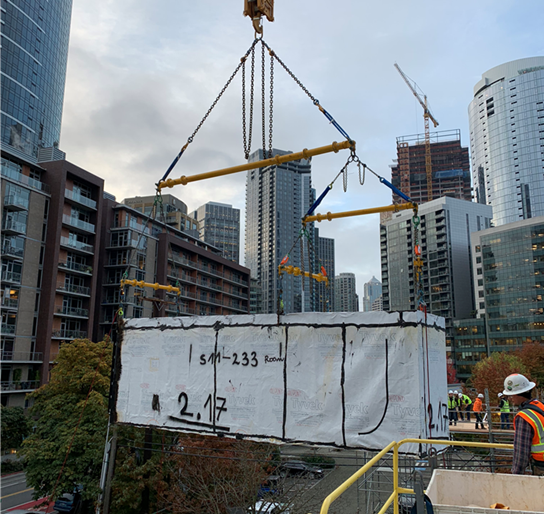 Modulift spreader beams combined with other rigging equipment in 19 different configurations to complete over 200 lifts during modular construction of the citizenM Hotel in South Lake Union, Seattle, Washington recently. CitizenM employed a construction method that involved piecing together modular parts that were manufactured by Modulift’s customer, Polcom, of Poland. The seven-storey building includes six floors of modular units, each one requiring 19 unique lifts—the beam and sling lengths were different each time—and 228 in total throughout the project. 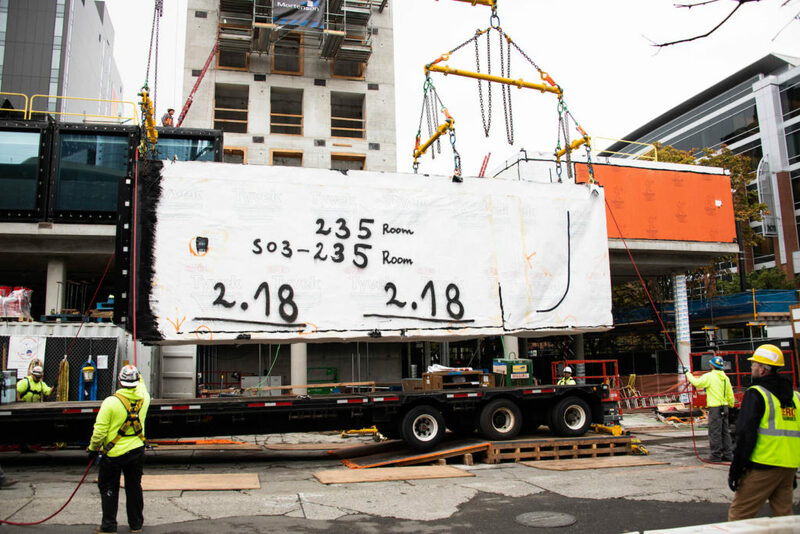 Construction firm Mortenson, which has built over 100 hotels across North America, accepted a scope of work as general contractor to assemble the 264 key modular building, which would eventually boast meeting rooms, a living room, bar area, and gym, in addition to the luxury bedrooms that represented the majority of the lifts by tower crane. 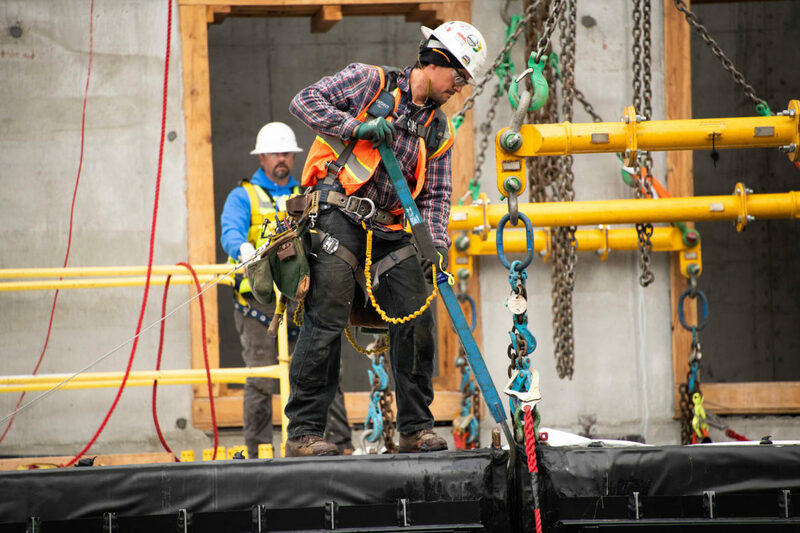 Jack McCaskill, project engineer, from the Seattle Operating Group at Mortenson, explained that diversity of rigging was required as the modules varied in size; the largest measured 10 ft. wide by 51 ft. long and weighed 45,000 lbs. (approx. 20.5t). Some modules had six lifting points and others had eight. Further, not all of those points were in line and some modules had offset centres of gravity. The heights of lift also increased as the hotel took shape, with the final storey reaching 70 ft. from street level. Modulift prescribed cascading rigs, consisting of spreader beams, slings, and shackles, which proved the most cost-effective below-the-hook solution. For the eight-point lifts, a one-over-two-over-four configuration was used, consisting of seven spreader beams at different levels; and for the six-point lifts, a one-over-one-over-three rig comprised of five spreaders at different levels. MOD 24, MOD 34, MOD 50, and MOD 70 spreader beams were all utilised during the project. The longest and largest was a 30-ft.-long MOD 70, while the smallest and shortest was a MOD 24 at 5 ft. The slings were predominantly chain slings with shorteners so that the lengths could be adjusted to accommodate the aforementioned offset centres of gravity, with polyester slings to connect to the beams for the lower height rigs.